Pioneer Square — the first neighborhood in Seattle, Washington, and the heart of its downtown in the late 19th century — presents an alluring mix of cobblestoned parks, restaurants, art galleries, shops, funky manhole covers, and noteworthy architecture (including the city’s nicest skyscraper, Smith Tower). But something forgotten, from another time, exists in the darkness below the concrete and asphalt. This entrance, with windows and doors now missing, used to be above ground. After the devastating fire of 1889 that destroyed 31 blocks of wooden structures, the city rebuilt quickly, with two critical changes. First, all the new buildings were constructed of stone or brick. Second, the city regraded the streets one to two stories higher than the originals. This latter decision both alleviated flooding that often plagued Pioneer Square, which had been built mostly on filled-in tidelands and where you could drown in a pothole, and ensured that gravity-assisted flush toilets that funneled into Elliott Bay at the base of the city did not back up at high tide and explode onto their users. It also unintentionally created today’s attraction, as explained by one of the stand-up comedians who double as guides with Bill Speidel’s Underground Tour. Speidel generated renewed interest in this lost city back in 1965, when he ran the first tour. Since then, his operation has been leading visitors and locals alike through this buried curiosity. I joined my group at the 1890s Doc Maynard’s Public House for the introduction before we walked a couple of blocks through the original Skid Row — the area of Pioneer Square where logs were pushed from the higher grounds above it and skidded downhill to the waterfront lumberyard and the ships that would carry them around the world. The only thing that remains of a business named Sam’s is its decaying sign. The guide halted before a locked door in one of the buildings to explain what we were in for. 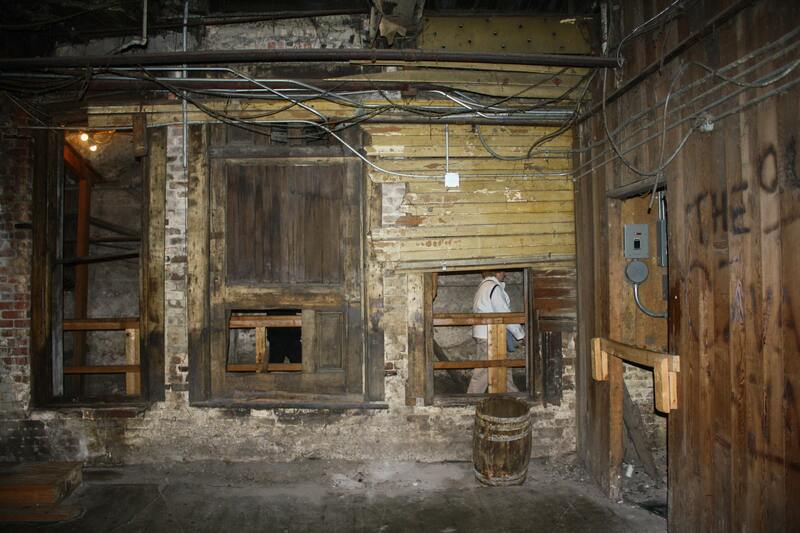 When the city raised the grade of the streets, buildings and businesses that had survived the fire soon found their original second story at street level (upper-floor windows had to be converted to entry-level doors), and the first floor was now underground. But that didn’t necessarily doom them — merchants continued to conduct business below ground, like a forerunner of an underground mall. Ladders led down to the old streets, and skylights with small panes of translucent glass were installed in the new streets to provide natural light to the subterranean level. 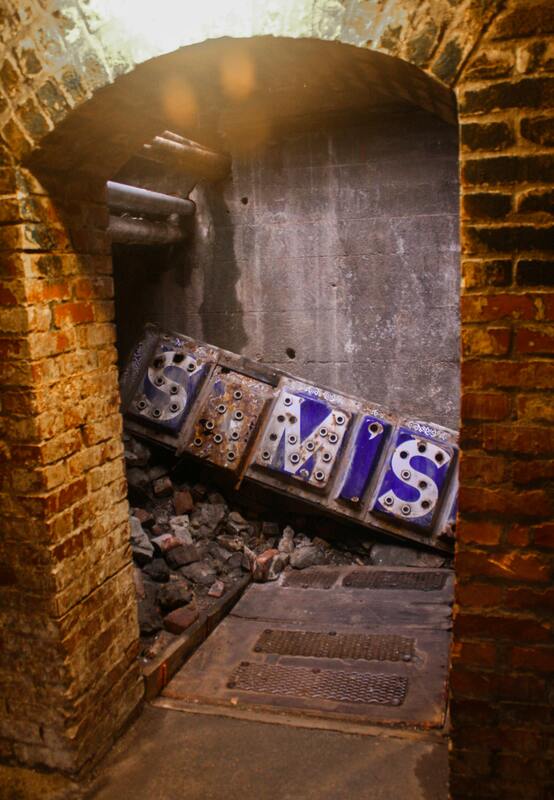 Pedestrians and shoppers continued to utilize the underground sidewalks and patronize the stores there until 1907, when the city condemned the Seattle Underground for fear of bubonic plague. We were about to see what remained. The guide unlocked the door and we descended into this underworld of creepy passageways. As we tread on uneven floors past wooden storefronts and glassless window frames, tangled wiring and ancient plumbing ran above our heads. As we clustered in one of the more commodious spots, the guide continued his tale. Once the Underground was completely shut down, a few of the businesses above it continued to use it for storage, but mostly it was left to deteriorate. The serpentine alleys and dimly lit shops took on nefarious aspects when illegal flophouses for the homeless, gambling halls, and opium dens started to operate here, and with the passing of the Prohibition Act in 1919, speakeasies began to proliferate. After some time, the Underground was cleared out once again, the vice was pushed out, and it became truly abandoned until Speidel resurrected it decades later. 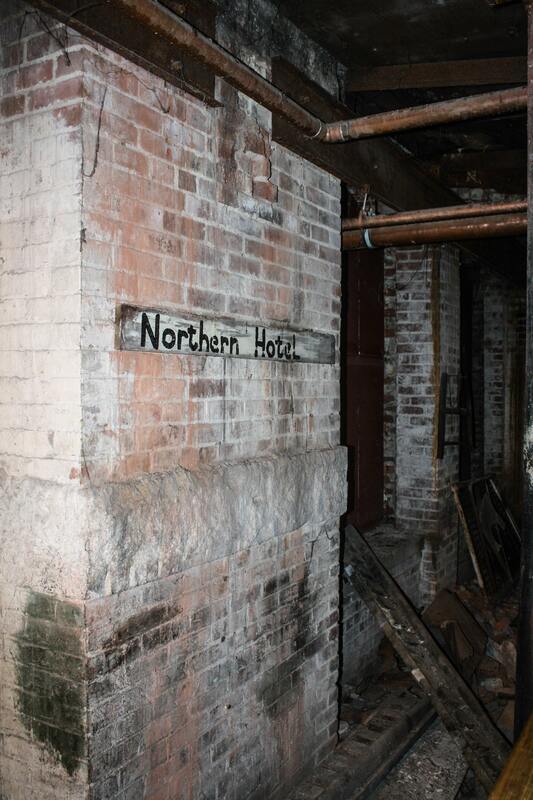 The entrance to the old Northern Hotel now leads to nothing. Along wooden gangplanks, we continued snaking our way through this labyrinth, passing by the old entrance to the Northern Hotel, a meat market, a ladies barber shop, and a bank that still has vault doors and a tellers cage. The guide would stop every so often to relay some information about Seattle’s seedier side, such as the curiously high number of women (estimated at about 2,500) who claimed to be “seamstresses” at a time when this new rough-and-tumble city was populated mostly by men and there weren’t a lot of women to provide such services for. In fact, these women provided other types of services, and the wealthiest of these madams left her astoundingly substantial fortune of $250,000 to the city for schools — an individual donation not matched by anyone in Seattle until Bill Gates a century later. Part history lesson sprinkled with fascinating factoids and some salacious asides and part comedy act that delivered more winning punch lines than clunkers, the tour of the Seattle Underground educated me, entertained me, and reminded me that sometimes things are not exactly what they seem.